We are recruiting cooks and waiters for a Hotel resort in Germany. 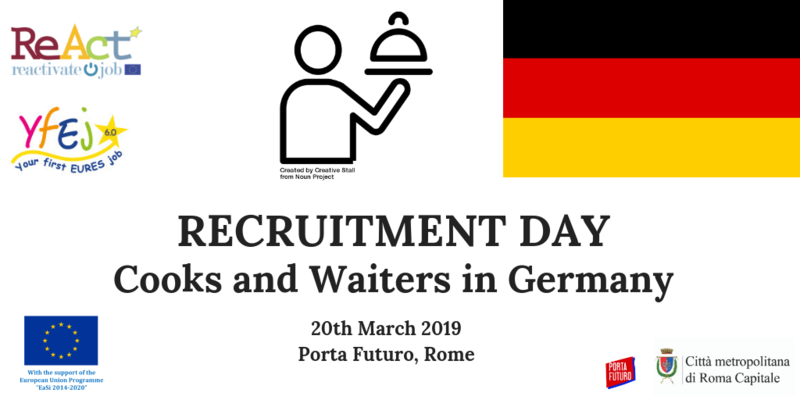 The recruitment day will be held in Rome, Italy, on Wednesday 20th of March. The employer is a Hotel resort inside a thematic park in Germany. It is looking for commis, demi chef, chef de partie and waiters (m/f) to prepare breakfast, lunch or dinner in one of our à la carte or buffet restaurant. For more information about the working conditions and requirements, please check the vacancy. To participate in the recruitment day, you must register on YfEj Platform and send an email to jobmobility@cittametropolitanaroma.gov.it indicating “Recruitment day Cooks/Waiters – Rome 20 March 2018” in the object. You will be given further information and instruction to complete the registration to the event.